It is amazing how simple praise and worship can be. A pure heart and a good guitar can lead us into an acoustic worship experience that will enrich our lives and bring us closer to God. With that in mind, twelve of today's most skillful songwriters join their passion and diversity to create what has become a Hosanna!Music tradition. 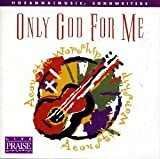 Only God For Me is the third album in its songwriter series. Recorded LIVE in Mobile,Alabama (home of Integrity Music), these twelve new songs will add to your worship experience with their infectious melodies and inspiring lyics. Experience the joyful liberation of Darrell Evans' "Trading My Sorrows," the passionate surrender of Bob Fitts' "I Come To You," and Paul Baloche's "Falling," a love song to our Savior that will tug at your heart. Each song on this album helps us better understand the matchless beauty of our God.